Have a furniture piece you want to chalk paint, but are a little nervous to do it on your own? Don’t worry, our much-anticipated chalk painting classes have arrived. 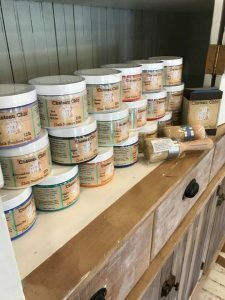 This introductory class will include an 8oz Chateau Chic paint and a Chateau Chic chalk paint brush. During this class you will learn: how to prep your piece, how to use chalk paint and different techniques for applying the paint. Just bring a piece you can carry in and let the magic happen! Tip: if you have a piece that is too large to carry, bring part of it i.e. a door or a drawer.